In a post I wrote about over year ago, I told the story of the “mystery of the stumps” where I described my relationship to the forest where I grew up, the forest to which I belong. I told the tale of a forest with mysterious stumps that my cousins and I couldn’t explain, and later, when I was 14, seeing the loggers come through and being devastated by the experience. I told the tale of the regrowth and healing of that forest as I ventured back in after many years, and the healing lessons that that forest provided. And now, there is a new chapter to tell–the healing medicine that the forest produced out of those cut stumps. Stump with reishi growing! These ones are too far gone to harvest, but they still make a lovely sight. This week, I took a trip back to my parents’ house and spent some time in the forest with a good friend. We had recently taken a summer mushroom workshop (which I’ll blog about soon), and we wanted to test out some of our new-found mushroom skills and see what else there was to harvest. 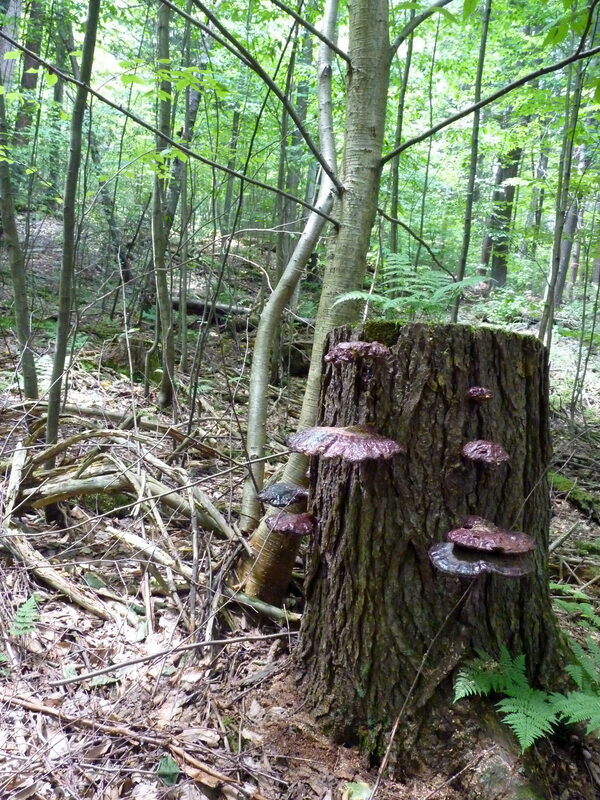 When we were there in May, my friend thought that some of the stumps might have the first signs of reishi (ganoderma tsugae) mushrooms, but we needed to look at them later in the season. And sure enough, when we returned, there the reishi mushrooms were, growing beautifully. Something shifted in me. This was plant medicine, powerful and meaningful. I already knew that the forest was regrowing, healing from its past injuries. But I hadn’t realized that nature would turn such a tragic occurrence into something magical and medicinal in return. I was and am always astounded by the gifts that nature gives. respect for this mushroom ever since. 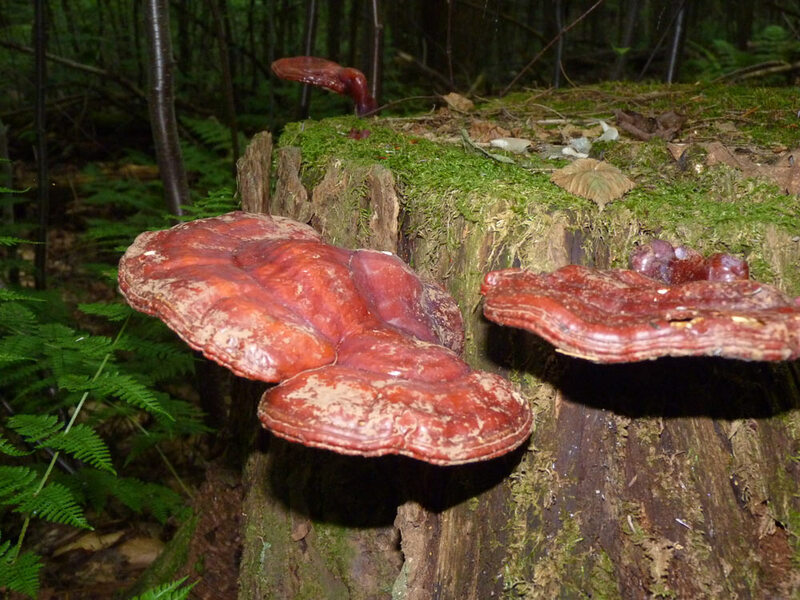 Matthew Wood discusses reishi mushrooms in his Earthwise Herbal: Old World Plants book. He says that the mushrooms contain protein, polysaccharides, phytosterols, and “help reduce autoimmune excess (heat) but also builds up exhasuted, cold people, rebuilds the adrenal cortex, regulates blood clotting, and protects the liver” (272). It helps with nervous exhaustion, sympathetic excess, or adrenal burnout, helps with allergies, aids in hypertension by inhibiting cholestreol synthesis and much more. He suggests that for Reishi to be effective, it has to be cooked for at least an hour and made into a tea or stock with soup bones (273). Reishi mushrooms, specifically the g. tsugae that are native to North America, prefer Hemlock trees–or in my case, hemlock stumps. Matthew Wood suggests that the Asian version of this mushroom, G. lucidum, likes oaks and chestnuts. Another related species that can be found is G. applantum, which grows on Maples. The reishi I found were part of a mesic forest with multiple streams, at the bottom of an Appalachian mountain valley and along the ridges near streams/creeks. This is the same kind of forest where you find ramps, dutchman’s breeches, and wood nettles (we also found healthy amounts of chanterelle mushrooms). Reishi growing from a stump! Harvesting of resihi can take place anytime after the mushrooms spore (you don’t want to harvest before they spored because we didn’t want to reduce the population of reishi). After they spore, the fruiting bodies have done their work and you can go ahead and harvest! This will likely happen sometime in July. You want to get them when they are still white on the bottom–about half the reishi or more that we found were past their prime with worms and bugs and stuff in them. We cut out the bad pieces, but its tough work. They get worms, slugs, and such later, which you can cut around, but which doesn’t make a pretty sight (see photo below). 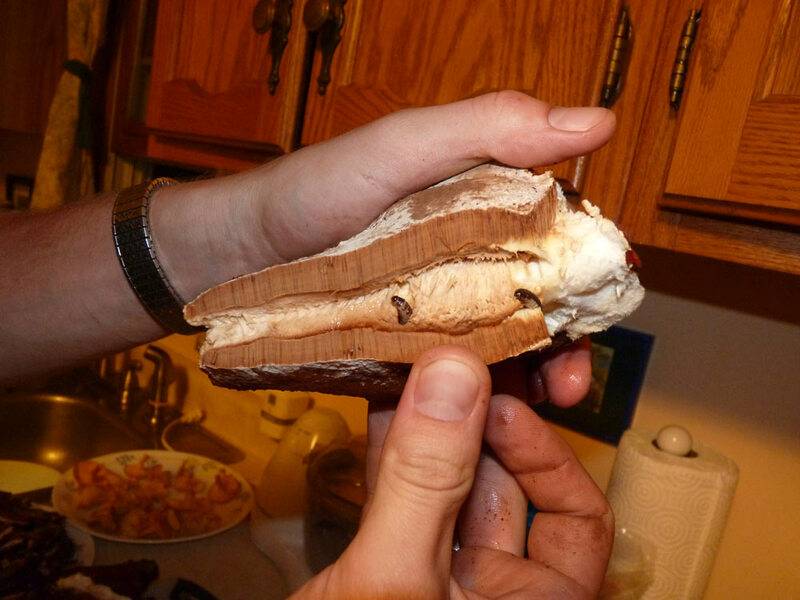 You can harvest reishi with a sharp knife. We used a cloth canvas bag to store our reishi. Here is my friend Paul harvesting reishi–you can note the nice white underside of the mushroom. These ones were a little smaller, but still quite nice. After you harvest them, you want to clean them (we washed them lightly) and then we cut them up into small slices and dried them in a food dehydrator. Here’s Paul cleaning and cutting the reishi. 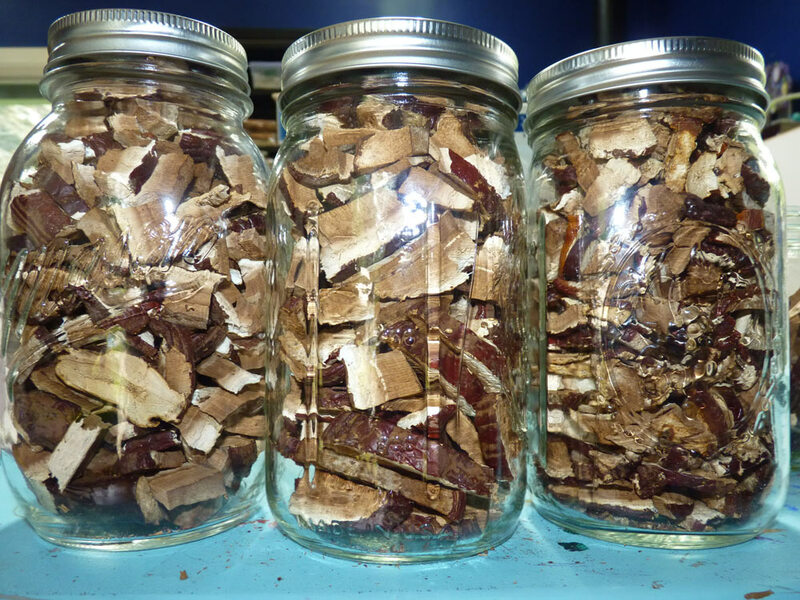 After about 12 hours, the reishi are dry, and you can store them in a mason jar with a tight lid till they are needed. What a wonderful mushroom! So I will take this as a medicinal mushroom, in tea and in tinctures (I will be providing a post on how to make a double-extracted reishi tincture in the future at some point!) It will always remind me of the healing power of nature, the importance of the cycle of life, and is a reminder of the blessings that nature provides. I hope that you, too, readers, will have the experience of harvesting and honoring this wonderful medicinal mushroom. Thank you for the interesting and informative article. Living here in New England I see a lot of these (we call them ‘wood mushrooms’ because that is what they usually are by the time they are found…equivalent to a piece of wood) but never realized they had anything but a decorative function…I’ve seen folks who take the dried ones and paint scenes on them for sale to the ‘city slickers’. By any chance is there a stage at which they have a culinary use, or is it a catch-as-catch-can on their edibility? OwlOak, the decorative mushrooms that people paint on are also medicinal. I don’t think they make very good eats, but their medicinal qualities are quite good :). Very nice…….I pick and use these myself. We share a friend in relationship…….. indeed. I know and interact with quite a few others as well. Good work man! Hi Cody, you are most welcome! Sorry about that Willowcrow………….my reference to “friend” in the comment above is the mushroom we are calling reishi. I know a few more here in North Western PA to. Hi I am very interested in looking for this mushroom. I’m in eastern mi. Do you know closer locations to me I could find these mushrooms? My fiance has fibromyalgia and we’ve been reading up for medicinal proposes and most of his side effects of fibro this mushroom can help with. Please any info would help! Thank you! They grown primarily on Hemlocks. I’ve seen hemlocks in forest around the Port Huron region (like state lands, etc). You’d want to look for a site that has a good amount of dead wood, etc. Question: I purchased some recently and when I cut it up, found some small white… Worms? Or tiny bugs. Is it safe to use this still? I would still use them :). Worms are common in a lot of wild mushrooms! Unless you think the worm infestation happened after they were dried–that’s a bit of a different story. 2) I found little greyish, fat worms (not maggots, but darker) that burrowed in. They seem to only burrow into much older reishi. The younger ones are eaten by slugs. Hi! 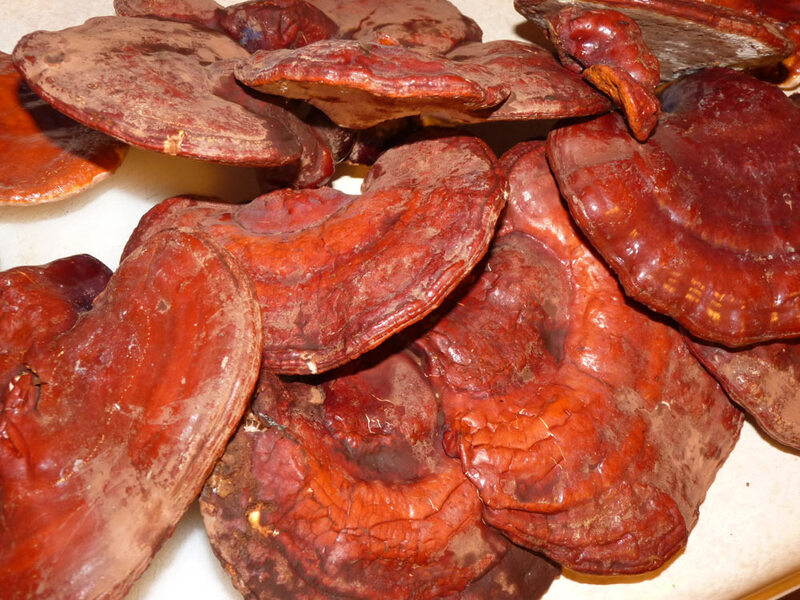 Do you know how long the reishi mushrooms last in the jar after being dried? Due you sell any of the reishi you harvest or have any recommendations on where im able to purchase sustainable wild harvested reishi? Thanks for your time, in advance.